Pietermaritzburg Cars in the Park 2019 Sunday – 26th May 2019. 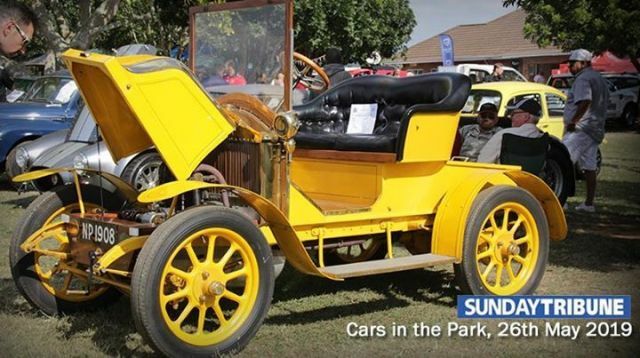 The Sunday Tribune Cars in the Park held at the Gold Circle, Training Centre, Ashburton, Pietermaritzburg, is the highlight event on the Vintage Sports Car Club calendar. This extremely popular annual event will be held on Sunday 26th May 2019. It is the largest of its kind in KZN, and the oldest of its type in the country, and is a draw card for motoring enthusiasts from all over South Africa with up to 14 000 people attending the show. The event is a large gathering of enthusiasts from numerous clubs and individuals, it features a wide variety of makes of motor cars, trucks, tractors and simply fascinating vehicles. There are over 1600 different exhibits, so there is ample to see, and do as you meander around the Gold Circle Ashburton Training Centre Park, an ideal setting for this event. +- 100 Vendors provide food, drinks, coffee, ice cream, craft market and business stands, creating an interesting shopping arena. A beer garden, live band, and a children’s playground area makes for an entertaining and fun-filled Family day. Many interesting vehicles can be seen at Cars in the Park, and in recent years it has featured antiques, veteran, vintage cars, vintage steam vehicles and tractors, including super cars, and the latest and greatest motorcars that manufacturers offer. Some special events will also be held on the day, details to be announced. Cars in the Park attracts a multitude of enthusiasts from various clubs including such well-known names as Alfa Romeo, Chevrolet, Ford, Jaguar, MG, Morris, Triumph, Mercedes, BMW, Volkswagen and Volvo to name but a few. Industrial and farm machinery is also displayed as well as a fine selection of veteran, vintage and classic motorcycles. A Silent Auction will again be held, interested in selling your vehicle please contact the organizers. Kids 5-12yrs get R 40.00 free playground vouchers. Gates open at 7.00am and the show closes at 4.30pm. Various Charities are financially supported through the show. Car Club members and car owners of pre 1980 models, bikes, special vehicles, etc, are welcome to enter their vehicle, motorcycles, etc for the show by going to our registration web page .https://register.carsinthepark.net/ and registering their vehicle for the event. A registration form will be emailed to you, to place on your vehicle’s windscreen, for FREE access to the event, for the driver and 1 passenger. A limited area for 50 post 1980 special vehicles will be available this year. Interested individuals to send details and photos of their vehicle to email registration@carsinthepark.net and the organizers will decide on its suitability. The cost is R 120.00 per vehicle for the driver and 1 passenger. The venue of the event is at the Gold Circle Ashburton Training Centre, directions are as follows: GPS co-ordinates are: 29°38’43.23″S 30°28’8.62″E Coming from either Durban or Pietermaritzburg turn off at the Ashburton N3 off ramp, and on the road over the highway, Pope Ellis Drive, turn right and follow the road for + – 2km to the Gold Circle, Ashburton Training Centre on the left.